In an ever increasing mobile priority world, videos are becoming more and more popular. It originated perhaps from watching videos on Youtube. Then the rise of both Vine and Snapchat along with the ability to make all your content look professional thanks to the help of professional-grade video editing apps has slowly become the name of the video editing game. Regardless of what you use your video editing apps for, you want to make sure you find the best ones for the job. You need to handpick the ones that are going to save the most time and possibly even make you internet famous. So with that in mind we’ve found 10 best apps to edit videos. iMovie is pretty much the king of video editing software for PC and now it’s made the crossover to app it’s still just as impressive. With iMovie you’ve got so many features, the most important for editing are going to be the splice which is extremely easy to use enabling you to bring together all the pieces of footage you want to merge and turning them into something engaging and high-end. With titles, tv-style templates, background music, voiceover capability and photos your video has the ability to become a masterpiece. If you want to use this for a more serious and refined purpose, indulge your inner-editing geek without having to sit at your desk all day or have a bit of fun with your friends and play around with the movie trailers. While many of the best apps for video editing are made purely for casual use if you want to really up your video editing game, try Pinnacle Studio. Having made desktop editing software since the 90’s Pinnacle knows what it’s about. A fast and easy editor is on offer here with extension range of image and audio tools for you to refine your work with. Lots of people liken the user experience to video editing from the iPad. Unleash your creativity and download Pinnacle for iOS. Take a closer look at Pinnacle’s movie making apps to get acquainted with all the features, there’s so many good ones you don’t want to miss them as they’ll make your video editing so much easier. Android used to be considered as a second-rate operating system in terms of creative apps, but times are changing and PowerDirector is proof that Android knows how to put a video-edit toolkit together. This a powerful editor that might of taken a few pointers from iMovie but the features such as the the video clipboard allow you to cut, arrange and edit, work with some transitions and add titles and images if you want. Surprisingly this app is free making it one of the best apps for editing your videos. You can however remove watermarks from your creations and export them in 1080p quality to be shared with the world if you pay the one off IAP. This is another great Android app for video editing and it works incredibly well even on smaller smartphones with a comprehensive set of tools with a clear, easy to use layout. Add a range of effects to your videos after the editing is complete or during the process to preview the different variations of the end result. The multi-tracked timeline with a simple but effective drag and drop feature is another awesome addition to this app, allowing you to easily import more footage and other files into the app while you still have full control over all the settings which response with one touch, so you really can make your best possible videos if you’re using Kinemaster to edit. Most definitely one of the best apps for editing videos, click through to see a quick video of KineMaster app in action. The only downside about this app is that the developer has kept it to a subscription payment plan rather than a one off download, but here you really do get what you pay for in terms of in app editing depth. Movie Edit Touch is an app editor for Windows Phones that proves it has the chops to compete with some of the larger video editors offered on other devices. It’s a well laid out video editor with a full range of tools. Join up clips, get perfect transitions, refine your edits in multiple different ways, add music and export the finished product as a HD movie, nice going Windows. I think we all agree in terms of design, the app looks great and it does fit the screen nicely. Originally made for Instagram, but suitable for all your video editing needs if you’re an iOS user. The main features here are that the layout is simple, lots of one-touch and drag options to help you create the video you want fast so it’s perfect for social media, a quick clip and pretty good for turning an old photo folder into something you might want to open. The app is now owned by Gopro giving you plenty of free video styles to choose from, this one is ideal for casual users. Splice is one of the richest app video edits in terms of it’s features and guess what it’s free to use with no catches. This lets you import and edit video clips individual, with deeper features such as video speed, free background tracks and trim and cut video with one tap action. Easily a contender. See this how-to on using Splice to edit your videos to help you get started. Given desktop’s long running success with Adobe products on desktop, the adobe app does hold it’s own. This one is designed more for speed and ease of use than exploring your creativity but it’s still very good at what it does allowing you to export so if you want to store your videos up in the cloud and be able to edit them quickly this one is for you. As we mentioned Adobe’s PC software, here’s a list of an amazing list of the best PC software for the days you fancy a change. LumaFX offers just as many tools as the other big video editing apps and deserves just as much of a moment in the best app spotlight. It’s mainly used for fixing single clips, which doesn’t sound like much but it’s an easy app for correcting small video mistakes that the other video editors don’t catch as well. Adjust and alter the video, add a range of effects that make you look like a editing pro. Don’t underestimate LumaFX for sticking to a specific side of editing, it’s a much more in-depth app than many review sites give it credit for. To see the app in action have a look at some of the effects available. This app is another great quick editor, it’s a similar style to Quick, if you want to add a bunch of clips or images and turn them into a movie without really having to pay attention, then this is the app for you. You can capture some photos in the app, choose from the range of themes and customizable options and within a minute or two Magistro will have selected the best bits using photo detection and you’ll have an animated short film – it’s that simple. Given Android’s lack of creative skill in the past a lot of people rolled their eyes when they announced launching Magistro an automatic video editor – which to some takes out the fun and skill out of the editing process. On the free version of Magisto video length is restricted to 60 seconds. If you want to go premium for a monthly fee then you’ll be able to create longer videos with extra features and have unlimited downloads. If you remain as a free user you can still download your videos for a small fee, check app store for pricing details. However despite the negativity, Magisto has managed to impress. Even the Android Police were pleasantly surprised by the results it manages to achieve for such a simple app in comparison to some of the larger apps we’ve mentioned. You can see from the list above that the power and depth of all apps especially those that focus on video primarily are growing and developing at a very fast rate. 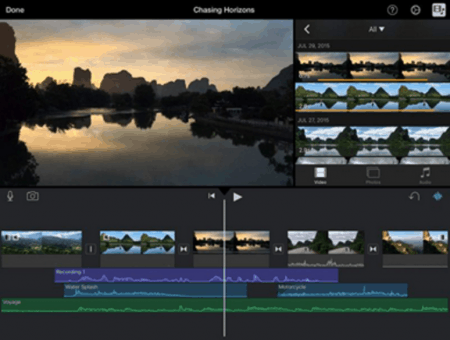 Given the success and quality of app video editing leaders like iMovie and PowerDirector how long do you think it is going to be before video editing apps overtake the top editing programs solely made for desktop? Just from looking at these 10 best apps to edit videos, we get an idea of how quickly these apps are evolving, it’s also possible that in time some of these apps with the right following could become platforms in their own right, but for now let’s just be glad these 10 best apps to edit videos exist!